site for the latest products and information. MDC Stirrups® are a revolutionary new stirrup design that positions your stirrups where YOU want them. Riders can now select any of three preset stirrup positions: traditional, 45 degrees or 90 degrees. The preset angles provide a competitive advantage by allowing for easy stirrup retrieval while on course. The preset angle improves leg, calf and foot position, relieves pressure on hips, knees and ankles, as well as reducing leg burns. Your pain will be relieved on your first ride. Greater safety is accomplished due to the open stirrup angle. This reduces the danger of being hung up and seriously injured. 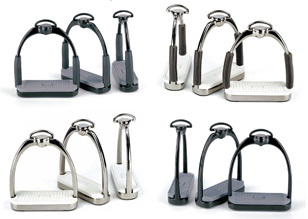 The stirrups are available in traditional stainless steel and black powder coating. Our sterling silver stirrups match our line of Sterling Silver Designer Spurs. The MDC Ultimate Stirrups® feature a shock absorbing, hinged foot plate while the MDC Comfort Stirrups® offer a traditional solid foot plate. All models are both design and utility patented world-wide.